Lockers are one of those items that no school can do without. What is the best way to arrange metal lockers? The best locker arrangement depends on your space. No matter what kind you are looking for, at Hertz Furniture, we offer you high-quality school lockers that are built to stand up to years of daily use. 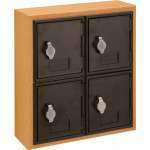 Choose from our single-tier steel lockers for maximum storage room. Need to save on floor space? 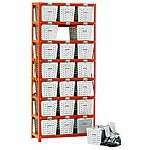 We&apos;ve got a huge selection of multi-tiered lockers in a wide range of sizes and configurations. 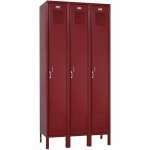 Open-faced gym lockers and steel racks keep your athletes&apos; uniforms and equipment organized and well-ventilated. How much should you invest in school lockers? Of all the school furniture items, lockers have got to be the ones that see the most abuse. While students do not of necessity slam their chairs down or bang on their desks, school locker doors get slammed tens of times per day, every day of the school year. At Hertz Furniture, we offer a huge selection of highly durable, built-to-last steel lockers that can handle just about anything your students throw at them – literally. What factors should you think about when purchasing school lockers? Making sure your metal lockers are strong is obviously not the end of the locker-purchasing story. In fact, it's just the beginning. When choosing school lockers, your school's size, floor plan, student body and budget all need to be taken into account when purchasing school lockers. 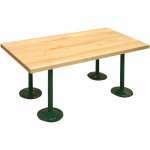 The best arrangement for steel lockers ultimately depends on all of these things. How big should metal lockers be? If you have the floor plan – and the budget – then you can allow yourself to purchase single-tier lockers. These lockers provide a huge amount of storage space. If your students have another designated place to hang up coats and jackets, then even if you're working with a generous budget you might want to opt for double-tier lockers. These are probably the most popular school lockers around. Double-tier lockers free up floor space while still offering plenty of space for students to store just about anything they might need throughout the day. Schools with a limited floor plan have a host of options, beginning with 3 tier lockers and going all the way up to six. However, the more tiers the lockers have, the less space is allotted to each student. The trick is to plan things so that everyone has a locker, while at the same time making sure that the lockers you purchase are large enough to be practical. If you buy lockers that are too small, no one will be able to use them. How can you ensure that lockers are secure? Once you know the size and amount of school lockers you need, it's time to think about the handles. If you have a problem with break-ins, then you might want to consider recessed handles that can't be kicked or sawed off. If you have a major echo in your halls, you should check out quiet storage lockers. These have a special handle that don't let the lockers slam as loudly as their standard counterparts. Whatever you choose, don't forget to think about locks. Many lockers come with options for built-in combination padlocks that can contribute to locker security. What kind of lockers are the best for a school gym? You might want to consider gym lockers. Student athletes definitely need a place to put their equipment, but even students who just need to change for gym class will probably want a secure place to store their clothing or school uniforms during PE. While some coaches prefer the security of traditional lockers, athletic lockers have the advantage of being either highly ventilated or completely open-faced. If security is a major concern, then you can try a traditional design for athletic equipment and steel basket units for uniforms and gym shoes. Since lockers are usually custom-ordered and therefore non-returnable, it's important to get it right the first time. At Hertz Furniture, we offer a whole design team that will work with you every step of the way to see that you get the setup that's just right for your school. Finances an issue? We have a wide range of financing options available. We have Hallowell and Penco lockers. Whether your needs, whatever your budget Hertz Furniture will help you get the steel lockers you need at a price you can afford.